On January 20th you can enjoy cold weather and a fantastic atmosphere in Sportpaleis if you decide to visit Antwerpen. Andrea Bocelli will come to town, and even though it might be minus degree and a cold win, your heart will get warm as you listen to the beautiful voice of Mr. Bocelli. It is very typical for big artists to visit Antwerpen and to have their concerts their, instead of coming to Brussels. But, if you are used to traveling a bit, that should not cause any trouble. You can get from Brussels to Antwerpen in about one hour, and if you live in a big city, you probably know that you can easily spend the same amount of time in your car within your own city boundaries on a day with much traffic and lines. So, jump on the train and travel to Antwerpen and enjoy the Andrea Bocelli concert on January 20th in 2018. Did you know that Andrea Bocelli is a real Saturday person? 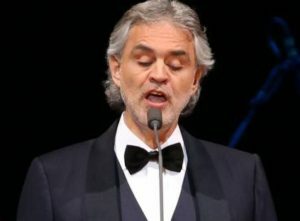 Almost all his concerts are arranged on Saturdays, and unlike most other artists doing concerts every day throughout the week, Bocelli normally only perform on Saturdays. If you click the ticket link above and search for Andrea Bocelli, you will soon realize this yourself. If you would rather listen to Andrea Bocelli in Prague in May and go to the annual Czech Beer festival as well, read more about those programs in the Prague Guide.